Formed in 1976 by a group of cross country skiers, who along with the U.S. Forest Service, became concerned about rapid growth of winter backcountry travelers with little or no experience, Cascade Nordic Ski Patrol was the first backcountry patrol in the Pacific Northwest. Patrolling was conducted from the parking areas around Snoqualmie Pass and coordinated with the pass Snow Ranger. Over the years our membership has varied between ten and sixty. 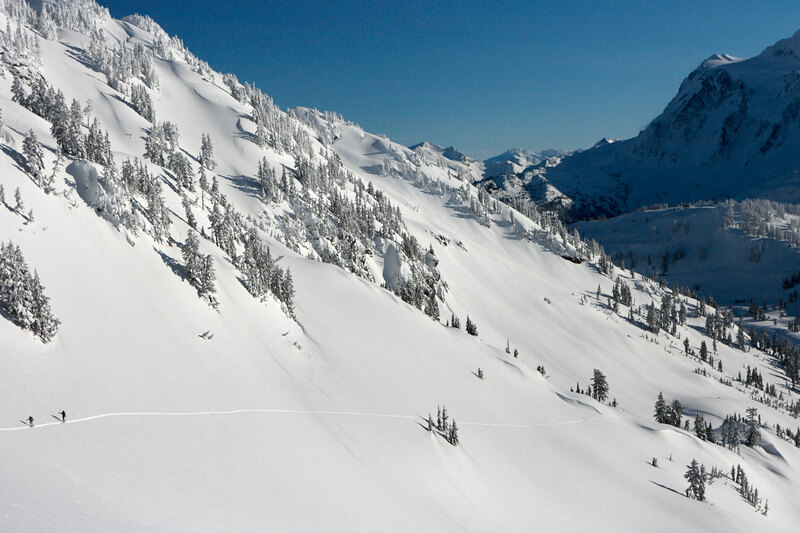 The name was changed to Cascade Backcountry Ski Patrol in 2005 to reflect changes in the range of travel and equipment used by in winter recreation. Many former patrollers have gone on to form other patrols, or become involved in teaching in other organizations such as Ski For All. Our primary mission is to serve the public interest in the backcountry areas of our territory in cooperation with Federal land management agencies and to be the recognized leader in avalanche and mountain travel and rescue training within the National Ski Patrol Northwest Region. We patrol the undeveloped backcountry slopes, trails and logging roads around Snoqualmie, Steven’s and Blewett Passes as well as Washington Pass in the spring. Our Stevens Pass operations are based out of the U.S. Forest Service facilities at Skykomish, and our Snoqualmie operations out of the Snoqualmie Pass Fire Department. Currently, four of our members hold National Appointments, with one serving as the Northwest Region’s Mountain Travel & Rescue Advisor. Two of our members have received the Silver Star award from NSP in 1996 and 2016 as the national runner-up in the Nordic of the Year selection process. Another of our members was selected as the Region’s Outstanding Avalanche Instructor three consecutive years, and still another was selected as the Divisions Outstanding MT&R Instructor. For five years running our members won National NSP recognition, receiving a yellow star for outstanding MTR instructor and also a gold star for National Nordic Patroller of the year in 2015. Our patrol was recognized in 2000 as the Region & Division Outstanding Nordic Patrol, won the Region award for outstanding training, was awarded a Unit Citation by NSP for a life saving attempt, and in 2001 was honored by NSP as runner-up in its annual Outstanding Nordic Patrol selection process. Many of our members also belong to the Ski Patrol Rescue Team (SPART), which provides year-around support to the King County Sheriffs Department through the King County Search and Rescue Association.